Newsweek magazine called negotiation ‘the game of life’ and indeed most wars come about as the result of failed negotiations. Negotiations between men who were desperate to avoid bloodshed after the carnage of the first world war and a man who cared little about how many died in his name, were doomed to failure. Arguably, had Britain and France negotiated on a more equal basis with Hitler, his star might have waned and the horrors of the second world war might have been avoided. You’re unlikely to be involved in negotiations that have quite so much riding on them, but understanding the basic tenets of negotiation is likely to help you in both your professional and personal lives. The British are notably coy about negotiation in everyday life, something to do with national reserve, but in many other societies, negotiation is a normal part of life. Indeed many British consumer organisations have demonstrated that if the reserved Brits can pluck up enough courage to ask for a reduction at a department store, the results are usually very positive. So what does a successful negotiation entail? If you’re not fully certain of what you want, how can you possibly have a hope of being able to achieve it? Set yourself and your team clear aims and objectives. To get a concession, you should be ready to offer something in return. You should pre-plan what you’re prepared to conceed, before the negotiation starts and to cover all bases you should have a few of these. I recently purchased a new vehicle. I went along to a dealer with a number of negotiating points in my pocket. I was buying in late November, a notoriously dead time for car purchases and a time at which car dealers’ cash flow is being stretched. With this in mind, I was prepared to make a decision there and then for the right deal. I had funds ready to go, so could close the deal very quickly and while I let the dealer know the dealer my ideal engine/colour configuration, I was prepared to compromise for the right deal. In the end I got a fantastic deal, but with the stipulation that I had to pay before the end of November. My ability to move quickly, compromise on what I wanted and pay within a couple of days had allowed them to compromise on price. Too many negotiators talk too much. Throw out your offer and let the other party do the talking. Try to avoid babbling your way to a bad deal – it’s often a weakness that shows itself in the excitement when a deal gets close. Don’t feel obliged to say something to fill the silence or worse still offer a concession – let your opposite number do that! It’s also easy to throw out casual remarks, in the interest of keeping the relationship friendly and relaxed, that can undermine your position. Knowledge is power, particularly in negotiations, so be careful what you say. It’s remarkable how many negotiations drag on and on and only get concluded when time becomes short. It’s very important before a negotiation starts to understand the time pressures and indeed, whether you can impose your own time pressures. 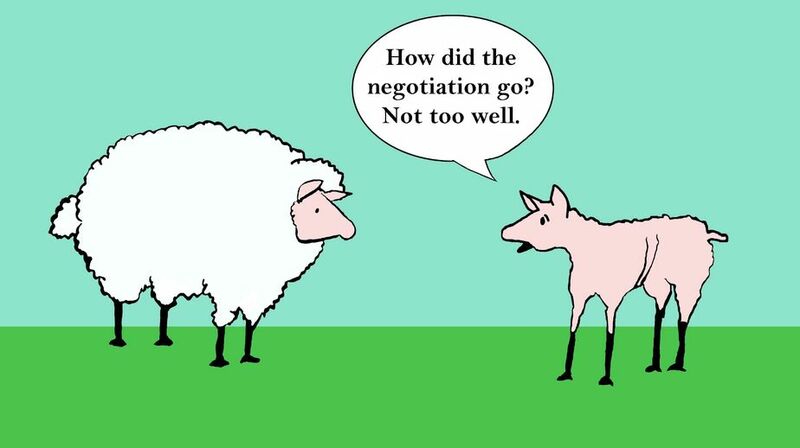 Studies have shown that negotiations concluded quickly tend to be bad for one or other party. If you have time, then use it, to make sure you get a good deal. Negotiations tend to have better outcomes where there is more than one negotiator involved. Clearly you don’t want a huge team, unless this is a massive deal, but a team of two or three will usually get a better deal than one individual. However, teams can also present problems and it’s important you do really work as a team and not a collection of individuals – a team where one individual blathers on, giving away concessions while the others are showing more discipline, isn’t going to work. Try not to be the first to concede, or concede too early. It’s better to find minor points to concede to protect the key issues and always plan what you are prepared to concede. Clearly most concessions happen when a time deadline approaches, so be careful that you don’t give away the family silver as the clock ticks down. I was involved in one negotiation, which now seems hilarious, but was a huge let down at the time. We were negotiating with an IT supplier over a failed delivery, where we were refusing to pay more and they were refusing to complete the delivery until we did. Negotiations started in a neutral venue at nine in the morning and dragged on with little progress until about three in the afternoon, at which point the senior man on our side asked to talk privately to the senior man on their side. Fifteen minutes later they had cut a deal that pretty much meant our side gave everything, with little in return. Quite deflated, I asked our team what had happened, on the way home – ‘oh that’s easy, someone said, Phil knew the M25 is hell on a Friday after 3:00 and he wanted to get home’……not the ideal way to negotiate! Negotiations work so much better when everyone understands where the parties are coming from and it can often help to keep the negotiations more civil. This is particularly important where an impasse is reached – both parties being honest about why they can’t move is often a way to find a deal. Sometimes it can help to go off the record with this. Hostile negotiations aren’t a lot of fun and wear everyone down. Sometimes they are unavoidable, but I’ve found humour is often the best way to defuse a tense situation, but of course you have to be careful – get too relaxed and you may end up letting things slip that harm your negotiating position. Is a rather overused phrase, but it is important that everyone leaves the negotiation happy, or reasonably happy with the outcome. There is little point bolting a supplier down to a deal that they can make little money from. You have to consider what sort of service you are likely to get from a supplier if doing your work is hardly worth their while. There is a temptation, particularly where things have gone wrong with a supplier, to just start kicking them and demand concessions that will make things incredibly difficult for them. This is particularly so in big organisations, where the negotiator feels the need to be seen to be beating up a supplier. However, this usually ends in tears. Negotiation is part of life and good negotiation skills can take you a long way. Often small and medium sized enterprises neglect to build the appropriate skills and yet they have arguably more to lose from a poor negotiation than a larger company.